If you see a sign which seems to have, for example, two names for the same destination - you're right. In the vast majority of cases the first name is Finnish, and the second name is the Swedish name for the same place. There are even some predominantly Swedish-speaking parts of Finland where the street signs are 'Swedish-first', but this is not common. What numbers do I call for emergency services in Finland? What do the Road Signs Mean in Finland? Are there special requirements for driving in Finland? Finns drive on the right and overtake on the left. 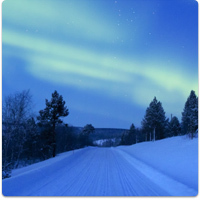 Driving in Finland during winter can be dangerous; winter tyres (either studded or non-studded) are a legal requirement from 1 December to the end of February but may be used until 20 April if necessary. Winter tyres without studs may be used throughout the year. Engine heaters in winter are recommended. All motor vehicles must use headlights whenever the car is being driven, in built-up areas as well as outside them. Motorists in Finland should remain alert for moose / elk and reindeer which frequently wander onto roads and are most active at dusk. liikennevirasto.fi - Traffic Conditions Road / Rail / Sea: The Finnish Transport Agency provides real-time information on incidents, road works, traffic conditions, traffic congestion, weather conditions, railway traffic and sea traffic throughout Finland. in English, Russian, Swedish and Finnish. Click the map for reports from that area. What should I know about Parking in Finland? Parking restrictions are strict but clearly indicated. Always park in the direction of traffic and at least 5 metres from any pedestrian crossings and intersections. Most cities have time-limited parking spaces which require the purchase of parking vouchers. These can be bought from vending machines on the street, which use cash and cards. The vouchers must be displayed on the dashboard. In some areas parking is not permitted without a parking disc. The need for a parking disc is always displayed on a separate sign, and should be placed on the dashboard displaying the time of arrival. What is the speed limit on Finnish Roads? *There are also winter speed limits. In winter most 100 km/h speed limits are reduced to 80 km/h. On motorways the 120 km/h limit is reduced to 100 km/h. What is the conversion for km/h to mph? What is the alcohol limit in Finland? The blood alcohol limit is 0.5 g/litre. A level of 1.2 g/litre or higher constitutes aggravated drunken driving. Travellers should be aware that drink driving laws are strict. Police strictly enforce all traffic laws and institute random roadside breathalyser tests. Those drivers who register a .05 or above alcohol content are subject to immediate arrest. 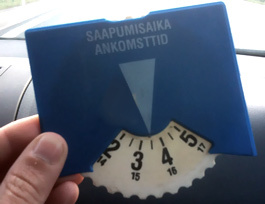 What are the seat belt regulations in Finland? In Finland seat belts are compulsory front and rear. What is the minimum age for driving in Finland? *Anyone who was aged 15 or above before 1 January 2000 is entitled to drive a moped without a moped licence. For those born in 1985 or later, a licence is required. What documents do I need to carry in the vehicle? Finland Insider: Jeff Elliott, an American expat living in Vesilahti, has put together an excellent site about Finland. See the Travel by Car section for info, routes, maps and more.